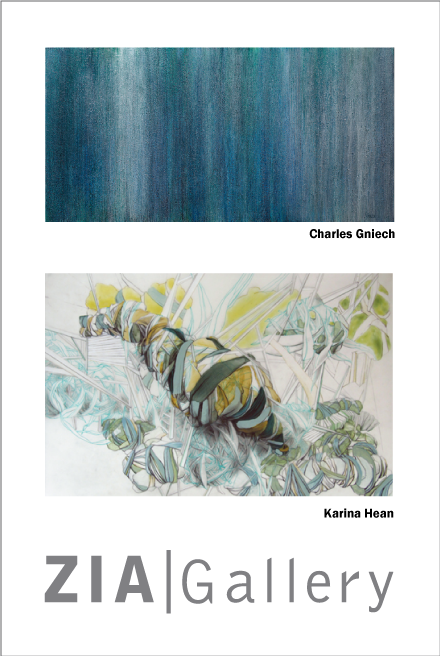 Charles Gniech and Karina Hean are exhibiting at ZIA Gallery October 19 – November 24, 2012 with an Opening Reception October 19, 5 – 7:30pm. All are welcome. This promises to be a stunning exhibition with the beautifully textured and meditative surfaces of Gniech’s paintings and the fascinatingly inventive forms suggestive of our organic environment -both internal and external, microcosmic and macrocosmic in Hean’s mixed media works on paper. These two artists, inspired by nature, arrive at very different ends. Gniech, who returns to influences found upon encountering the megaliths of Britain, creates rich monochromatic paintings both minimal and subtly detailed. The colors evoke weathered stone to fiery magma. Hean’s inspiration derives from a childhood growing up on the Chesapeake Bay. Her works explore vast variations of form, tangled complexity, and dynamism. Works appear massive while being of modest actual scale or suggest microscopic forms while being depicted on a large scale. Karina Hean was awarded an American Artist Fellowship at the Ballinglen Arts Foundation, Ireland and has completed several artists in residence opportunities in the US. Her work is exhibited in solo and group exhibitions in museums, galleries, art centers, and universities throughout the US. Chicago-based Gniech has been included in exhibitions at The Rockford Art Museum, The Fort Wayne Museum of Art, The Quincy Art Center, and the Schoenherr Art Gallery of North Central College. Gniech’s paintings are in numerous public and private collections. This entry was posted in Openings and Events and tagged art, Charles Gniech, Chicago, Karina Hean, painting, Winnetka, ZIA Gallery. Bookmark the permalink.